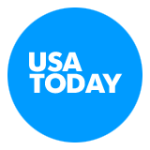 Brett shoots print campaign for USA Today! Wulf Casting has selected Brett for the role of GEEK CHIC MALE in a major print campaign for USA Today! The ad is looking to run in October. [MALE GEEK CHIC HERO] Male/ Caucasian/ 25-30/ Geek Chic, appealing every man, John Krasinski type. Business casual attire. Great facial expressions.